Wisdom teeth: most of us have them, and most of us get them extracted at some point. While they’re a standard part of the human body, wisdom teeth can cause some serious problems. Between impactions, crooked growth patterns, and infections, it’s no wonder that wisdom tooth extractions are some of the most common dental health procedures in the U.S. today (not including emergency dental treatment). In fact, about 85% of people have their wisdom teeth removed in their lifetime. So, are you one of them? Should you have your wisdom teeth removed? Here’s what you need to know. Lots of people don’t have enough room for extra teeth. The average human mouth has room for about 28 teeth, which happens to be the number you have before wisdom teeth come in. Because of this, it’s often cramped quarters, creating impaction and growth issues and harming your other teeth in the process. Wisdom teeth can cause gum pain. It’s common for people with wisdom tooth issues also to experience gum pain. Why? 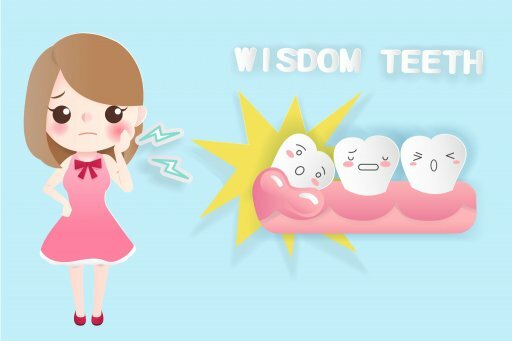 Because wisdom teeth, when they’re misaligned or impacted, can cause infection and other painful conditions in the mouth. Wisdom teeth may come in crooked. If they do manage to break through your gums and find a place in your mouth, they may come in crooked, which means they won’t be functional and may cause further problems down the road. Wisdom teeth are vulnerable to cysts. Cysts pop up with sacs around the teeth and fill with fluid. These cysts can range from benign to severe. If they’re serious, they may damage surrounding structures, including tooth roots and bone. In some cases, cysts can even lead to tumors that require surgical removal. For most people, having your wisdom teeth removed is the right decision. Not only do they not serve any real purpose in your mouth, but they have the potential to cause a whole host of problems as they grow in and take up space in the mouth. If you’re not sure whether you should have your wisdom teeth removed, talk to your dentist. He or she will be able to talk through the various outcomes with you and help you come to an informed decision. So, you’ve decided to have your wisdom teeth removed. Now you’re wondering what you can expect from the surgery. Luckily, wisdom tooth extractions are common, run-of-the-mill procedures. As a general rule, the surgery only takes an hour or less. You may experience some light bleeding after wisdom tooth removal, although applying pressure to the affected area will help remedy it. If you experience swelling, your doctor may have you place an ice pack on the outside of your cheek and hold it in place for about ten minutes at a time. Over-the-counter pain medications are also typically recommended to keep discomfort at bay. If you have any more questions about dental procedures, small or large, please contact our Orange Beach Alabama Office today. We’re here to answer any questions you may have and are always happy to help you move forward in your decision!